At Magnum, we’re truck enthusiasts first and manufacturers second. Which means we get as excited as you do when we hear the latest updates and coming trends within the truck world. We’ve put together a list of five of the most exciting truck updates that we’re looking forward to. “The age of stripped-out, bare-bone midsize pickup trucks is a thing of the past as new models are packed to the brim with features from larger trucks. 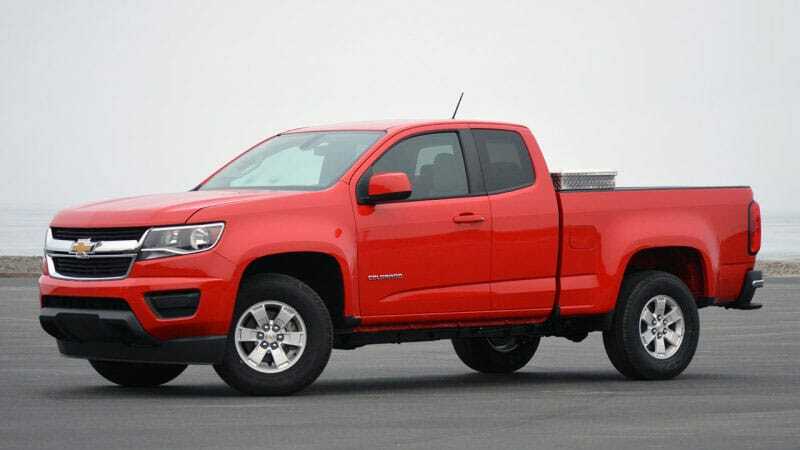 To give the 2017 Chevrolet Colorado a leg up on the competition, the automaker fitted the pickup with a brand-new V6 engine and an eight-speed gearbox. The 3.6-liter V6 is the same engine found in the Cadillac, ATS, CTS, CT6, and XT5crossover, a Chevrolet spokesperson confirmed. Just like in the Cadillac models, the V6 features a host of technology, which includes improved variable valve timing, improved direct injection, and Active Fuel Management. As the moniker implies, the engine is capable of shutting off two cylinders for improved fuel efficiency. Thanks to the new tech, power increases to 308 horsepower and 275 pound-feet of torque (up from 305 hp and 269 lb-ft of torque). The new engine is mated to an eight-speed automatic transmission. The gearbox is roughly the same size and weight as the six-speed automatic unit it replaces, but has a higher first gear ratio and lower rear axle ratios. “Nissan is now offering its first-ever single cab in the Titan lineup. That brings the grand total to Single Cab, Crew Cab, and King Cab. Both the ’17 Titan and Titan XD can take advantage of this configuration. 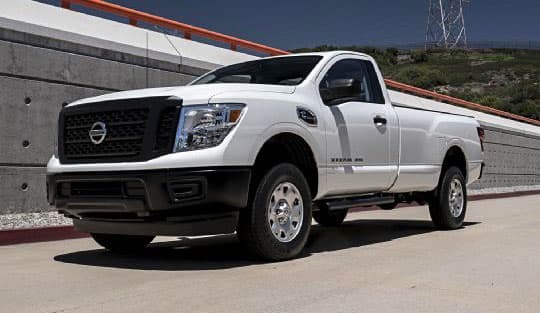 And the Titan can now boast having the best pickup warranty—or what Nissan is calling “America’s Best Truck Warranty”—which is a 5-year, 100,000-mile, bumper-to-bumper warranty, including powertrain” (trucktrend.com). “According to a study by Michigan’s Ducker Worldwide, more than three-quarters of 2025 pickups will have body and closures (doors, hood, tailgate, etc.) constructed of aluminum, the biggest increase among vehicle segments. The study projects an increase of more than 10 times in the amount of aluminum used in bodies, bumpers and closures of all cars, SUVs and pickups in the next 11 years.This bullishness on aluminum is attributed to its popularity in luxury and sports cars today and the 2015 F-150. Ford’s already shown 739 lbs. of watermelons virtually equal the weight taken out of a 2015 Crew Cab 4×4 Lariat courtesy of the aluminum body, but the new F-150 has nearly 1100 lbs. of aluminum overall. Next year, SUVs and crossovers will have the highest aluminum content (overall, not bodywork), followed by D segment cars, pickups, and C segment cars. 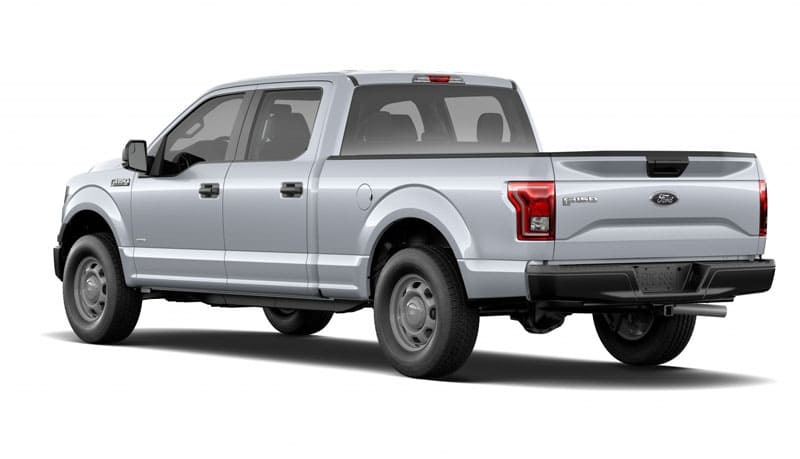 Two years ago there were more than 20 cars for which 10 percent or more of their curb weight was aluminum, but none were pickups. More aluminum goes into engines, transmissions and drivelines than anywhere else.By 2025, the average new vehicle is projected to have 550 lbs. of aluminum, up from about 30 five years ago, and 75 percent of pickup body and closure parts will be aluminum, compared to 24 percent for E-segment cars, 22 percent of SUV/crossovers and 18 percent of vans. Note, by 2025 some of those E-segment cars may well have greater concentrations of carbon fiber or other exotic materials. “Earlier this year, we caught a Ram HD mule with a prominent hood scoop, leading some to believe that Ram was toying with the idea of offering the Hellcat supercharged Hemi V-8 in its purpose-built HD off-road truck, the Ram 2500 Power Wagon. Now, we find yet another Ram HD with a hood scoop but of a different sort. This time, the scoop is much lower-profile and less prominent than it was in the earlier mules. The spy shooter believes these trucks are Cummins-powered. Interestingly, General Motors shared some details of the dual-circuit intake system on its 2017 Duramax HD trucks, with the air intake split between a hood scoop intake and a conventional fender-mounted intake. “GMC’s 2017 Sierra HD range has been expanded with the addition of the firm’s redesigned Duramax 6.6-liter turbo-diesel V8. Now more powerful than ever, the new Duramax V8 will replace the existing unit in GMC’s range and is promising improved refinement thanks to its new construction and selection of updated features. On the statistical front, the engine pumps out 445 hp and 910 lb-ft of torque, a 19 percent torque rise over the existing V8. Impressively, 90 percent of the unit’s torque is available at a low 1,550 rpm until 2,850 rpm, making the Sierra HD particularly useful for towing. 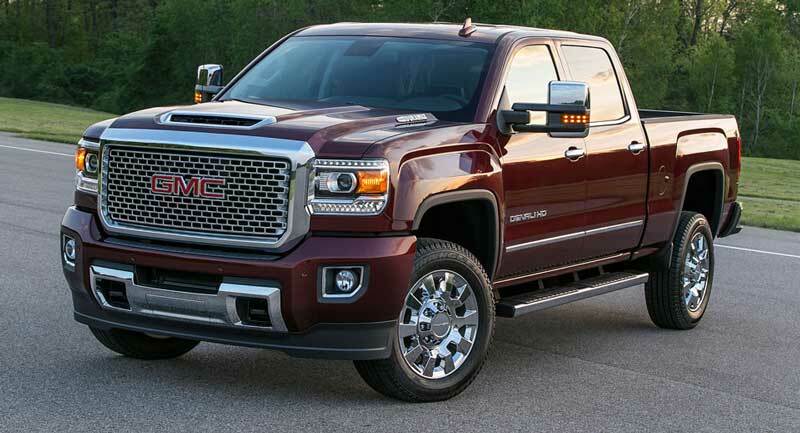 To achieve the additional power and torque, GMC has gone to town with the engine. For starters, there is a new cylinder block and cylinder heads, increased oil and coolant flow capacity, updated electronically-controlled turbocharger, a different solenoid fuel system, B20 bio-diesel compatibility and a full-length damped steel oil pan and refined rocker cover, two elements that make the engine quieter than the old unit. Elsewhere, the camshaft profile has been altered, further aiding in the greater power. Stay tuned to the Magnum Blog for truck trends, industry news, and much more! ← What is E-Diesel and Why Does It Matter?